Princess has been studying the continents and oceans. The continent of study last week was Antarctica. I have been using a well put together unit entitled It’s a Small World by Molly Lynch. Mostly, I try to use free resources I find around the web, but this unit I would purchase again in a heartbeat. Builder went through this unit a couple of years ago, and is having fun going through it again with Princess. We went over the information in the unit regarding Antarctica. Since there is not a population to speak of, we concentrated on mostly the animals and the ice! We took a look at all the different kind of animals that live there. We watched The Magic School Bus episode In the Arctic. (I know it’s not the Antarctic, but the info translates!) This gave a lot of information as to the adaptations of animals to live in such a cold harsh environment. The unit mentioned above has a fun experiment using shortening in between two zipper sealed sandwich bags to make “blubber gloves” which allows you to keep your hand in ice water for quite a long while. We didn’t have enough shortening on hand so we did a few different activities. We used Google Earth to zoom in and take a look at Antarctica. The free part of Google Earth is all we use and is enough for us. It really helps Princess bring into perspective where the continents are and get a “real life” look at the different environments. She has had a blast investigating the earth. Now, when she colors the continent on her worksheet she wants to see it on Google Earth so that she can color it correctly! After exploring with Google Earth, Princess and Builder did some ice excavation! I had prepared two containers with objects placed in water and frozen it for a few hours. So the kids used pipettes and syringes with warm water to melt their ice blocks. Builder decided they needed forks (a.k.a. pick axes) to explore and excavate as well. I placed the ice blocks in a larger tray so that as it melted the water was contained. This gave us a chance to talk about what would happen if all of Antarctica melted. 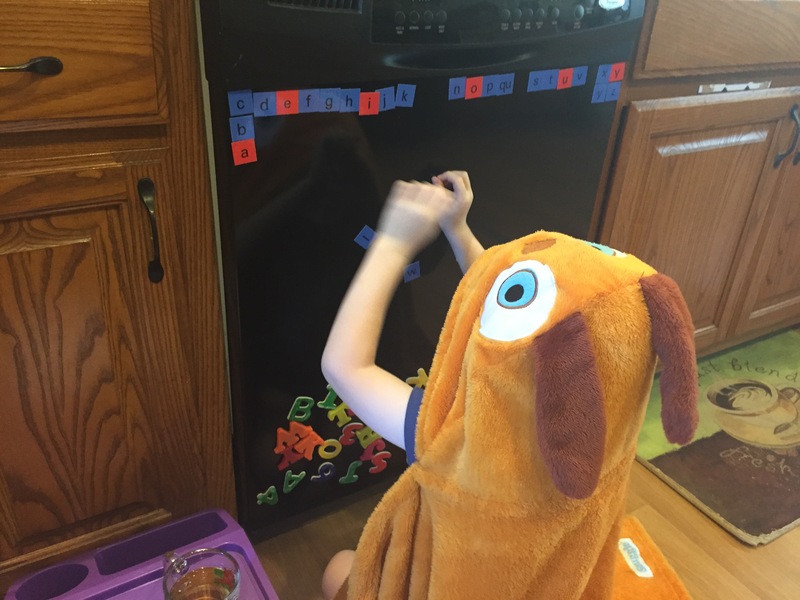 They had a blast with this activity and went on to create two more of their own ice blocks. So much fun! Your Turn ~ What activities/units have you enjoyed doing more than once? We have completed two weeks of school after our six week break. It has been good having many activities to pass the day. However, it has been a challenge to get our rhythm back. I have faith; it will come. Adding an increased amount of activities for Sunshine has “leveled up” my preparations a bit, but it is well worth it. There have been many times recently that she has asked to have her “school stuff”. At first having two to prep for was a little daunting. I was thinking that there was a need for two separate streams of preparations…Builder doing such-and-such, Sunshine doing such-and-such. Then the realization hit…all that’s needed is to take what Builder is doing and find an age appropriate version for Sunshine. This approach has worked well. 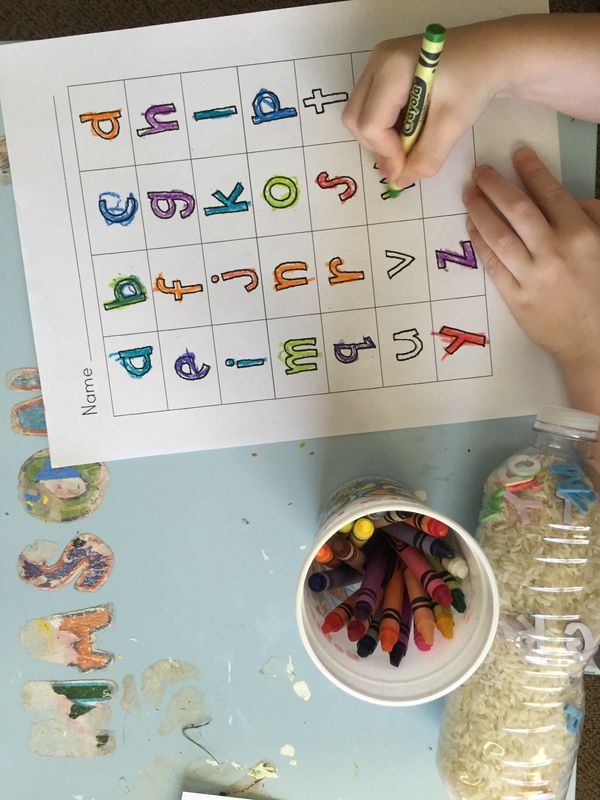 So, for Sunshine I found a cute, fun activity over at Growing in Pre K that focused on alphabet familiarity and recognition of upper and lowercase letters. The initial activity was to place letters in a bottle filled with rice. There is a sheet with all the letters of the alphabet. Once the letter is found you color the letter on the sheet with the corresponding color. Builder thought this looked fun so he decided to have a go. Sunshine was not as intrigued, so I left her supplies out on the table and let her come back to it in her own timing. The next day, she came back to it and asked to pour the letters out of the bottle to find them. We ended up pouring the rice and letters into a bowl so that she could sift through with her fingers. This kept her busy for a long while. 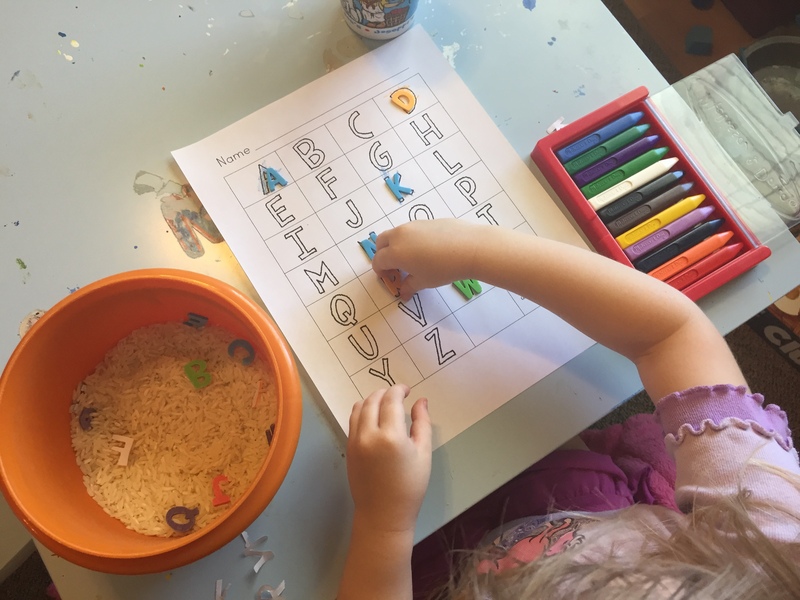 She was very much involved with the activity this way and decided she wanted to color the letter and then stick the foam letter on top. Love it! What a great hands-on version of this activity. Honestly, one I never would have thought of myself. It took coming back to the activity two or three times before she finished, but she always came back to it. Thank you Lord for the creativity you give to each of your children. And, thank you Lord for giving me the eyes to see it.